The play has a neat and rather simplistic plot but has some striking Shakespearean themes. Margrit, our heroin, is trapped in a loveless marriage to Bengt Guateson, a rich but foolish man. On the day of their anniversary (in honour of which the couple are hosting a feast) the infamous Viking, Knut Gesling, comes to the couple’s wealthy home demanding the hand of Margrit’s younger sister Signe. Margrit agrees but on two conditions: first, Knut must prove he can be peaceful; and second, Signe must show herself to be willing. Shortly afterwards, Gudmund, the dashing childhood friend of Margrit and Signe, returns unexpectedly. Margrit and Gudmund were once very much in love and Margrit is convinced he loves her still. Sadly, Gudmund (rather inexplicably) turns his attention to Signe. What then follows is a series of conversations whereby everyone gets the wrong end of the stick, hearts are broken, axes are brandished and murder is contemplated by most. The walls of the theatre are thick and made of stone; the old and rickety fold-down theatre seats add an earie charm; the stone columns make for church-like solemnity. The set is simple but effective and truly medieval. Lanterns flicker from the walls casting trembling light onto the silver trinkets cast about. The stage, and theatre, is small and intimate, so there’s not much room for anything else other than a wooden chair and the actors themselves. The Nordic-looking Lucy Pickles shines as Margrit; she and Gudmund are certainly the stars. Both actors expertly navigate the rhyming verse so as we rarely hear it. Margrit’s character is certainly the most complicated: her girlish spirit has been broken and twisted by bitterness and disappointment. Margrit lurches between passionate hope and vengeful rage. Despite it being a challenging role, Lucy Pickles handles it with grace and poise. The role of Gudmund is played by the handsome Will Timbers; there is true chemistry between him and the fiery Margrit. The other roles are fairly one dimensional and are written, really, as vehicles for Margrit’s story. The role of Signe, played by Kelsey Williams, requires little but girlishness, and it would have been difficult for her to develop the character further. Peter Wheal-Jones, playing the part of the Viking, Knut Gesling, has made the bizarre choice of playing the role as a 1960’s Bond villain; though his stuffy pompousness is not exactly Viking-like, it is undeniably entertaining. The Feast at Solhaug is, as is typical of Ibsen, a study of a trapped and cloistered woman. It must be said that this play is less developed and accomplished than Ibsen’s later works. Yet, the play is a challenge to the societal norms of the time and thus bares significance. 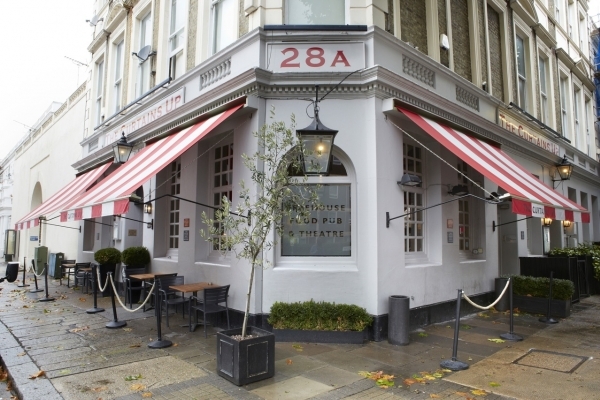 As a world premier in English, The Feast at Solhaug at the Baron’s Court Theatre is definitely a must-see for Ibsen fans but it also a great place to start for new-comers to his work. The Feast at Solhaug runs until the 25th April.